Does Savage Summoning work on Bestow? Sheoldred, Whispering One & Vorinclex, Voice of Hunger : Those guys are dangerous, Not sure if your deck can manage to show them in play or in the graveyard and survive the focus tou'll get. I personally stoped playing them for this reason. Bear Umbra, Curse of Bounty -> What do you do with the untaps ??? Glad I could help. I know underdog Decks are more fun to build. Sometimes you find something that hits really hard with something nobody tought about. 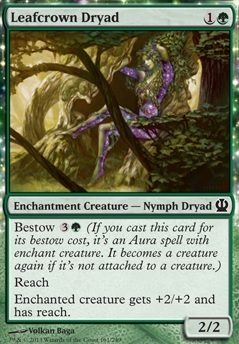 Oh and I found a nice Aura you could use instead of Leafcrown Dryad: AEther Web. Altough it won't be put into your hand with Lead the Stampede. It also grants reach, only gives +1/+1 but has two advantages:1st it adds another instat speed interaction like oh you want to bolt my Phantom Tiger? To bad I have this. And maybe you get to kill another attacker with it. 2nd blocking creatures with shadow can be a big deal against some combos. In between I have two Modern Decks build around some Kamigaw Kamis :DOne is listed here Foretold Celestial Wrath (should be at least tier 2 altough it only uses 10 Kamigawa cards in main and 5 in sideboard) the other is a little more casual but works sometimes (about Tier 2.5) because of the green ramp kamis, which is why I'd never say aything against Elder Pine of Jukai or Petalmane Baku I just know how good those two ramp especially with the non pauper legal Loam Dweller. Oh and I also made a Pauper Arcane Deck maybe you liketo check it out Arcane Dredge Burn. Too bad there aren't more arcane spells like Ideas Unbound. Thanks Austin_Smith_of_Cards for your suggestions. Yes, as MTGplayer00 suggested too, 4x Kird Ape is pretty good in this deck. I removed both Leafcrown Dryad, as I have other ways to deal with fliers in the mainboard and sideboard. I added a 4th Blastoderm, as it is a very strong creature. Finally, I change some land to help playing key cards on curve and removed some cycling lands. I will play more game with this list and let you know how it goes. Either one works I suppose. 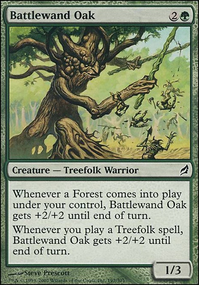 If I were you I would cut Leafcrown Dryad for that early game aggro. 4 mana for an aura that gives +2/+2 and reach is not the greatest in my opinion, especially considering that you have Elephant Guide which I think is more effective at that. If you want flyer hate I would just put something in the side if I were you (some effect similar to Matsu-Tribe Sniper - which is great faerie hate, too). 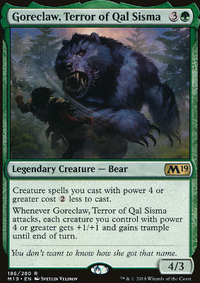 Also consider Kird Ape and maybe adding some more multicolored creatures to squeeze value out of Naya Hushblade and Jund Hackblade. If you have multicolored things Jund Hackblade effectively becomes the best possible version of Gore-House Chainwalker and Borderland Marauder. Okay, I've played around with this some more and am working out some ideas. These comments are in reference to my own hexproof deck: Godzilla and trying to learn from Wahrghoul84's experiences and hopefully provide what little insight I can. So, finally, in some way, I agree. You don't need Utopia Sprawl unless you're playing 3+ casting cost spells. Since you aren't it's probably more a hindrance than an advantage. So I bow to your wisdom here. 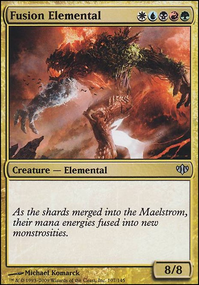 As far as types of enchantments, I've recently replaced Abzan Runemark and Leafcrown Dryad with Rancor, Hyena Umbra and Spider Umbra and noticed a marked improvement. My hand is now coming down into play where I used to sit on cards. So, again, I also bow to your wisdom here. But here is where I'm diverging. So far, I prefer Aura Gnarlid, Kruphix's Insight and Ancestral Mask to Angelic Gift and Kor Skyfisher. 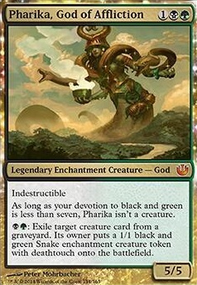 I realize you get some speed and card drawing from Angelic Gift and Kor Skyfisher, but the hammer you can put down mid-game with Aura Gnarlid, Kruphix's Insight and Ancestral Mask is immense. And if you can couple an Aura Gnarlid with an umbra, it gets really ugly for your opponent fast. It was pretty common in my playtesting to be attacking with a 1/1 hexproof, a 10/10 hexproof and an 8/8 unblockable umbra'd Aura Gnarlid on turn five. But that was only all possible with some combination of Aura Gnarlid, Kruphix's Insight and Ancestral Mask. But I admit, this is probably the key difference between a full aggro hexproof deck and a mid-game hexproof deck. And for now, I am willing to settle for the latter. So that said, I get the idea behind Kor Skyfisher to attack quickly, but I struggle with why you're playing Angelic Gift. You can use it to draw a card. Fine. 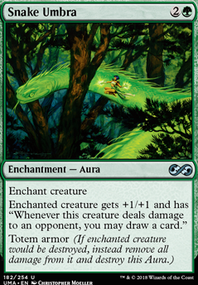 But flying doesn't really get you anything on it's own and since your're not playing Ancestral Mask, Aura Gnarlid or Yavimaya Enchantress your enchantment count isn't critical. It would seem like for just drawing a card, Frog Tongue is better because it's cheaper. Overall, I feel like you'd be better off just playing a good enchantment. I feel like Briar Shield, Lunarch Mantle, Favor of the Overbeing, Glaring Aegis or Sun Clasp are better options. So far you've had far better ideas than mine, so what am I missing here? TheHroth on What Is Your Magic Reach?